John Jessop, a pioneer of the financial information business, has written a riveting and thoroughly amusing memoir – as he would be the first to acknowledge. 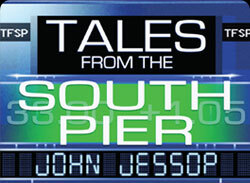 Tales From The South Pier tells how John, born and raised in one of the less salubrious eastern parts of London, joined Reuters, the venerable international news agency, when he was seventeen as a newsroom dogs-body – which largely entailed fetching tea for a large group of permanently thirsty tea addicts – before working his way up to becoming in turn a reporter, editor, salesman, senior marketing executive. Having made his mark in news, and having been transferred to New York, John left the editorial side of the agency to enter the field of sales and marketing. It was a career change he describes as “largely mercenary in motive, but also reflecting a desire to do something different”. Reuters had sent him to New York on a six-month assignment. He stayed for 26 years. comments. “Even worse, perhaps they hadn’t forgotten.” Either way, he was to spend most of his working life in the Big Apple – first at Reuters, then at a fledgling, entrepreneurial competitor called Telerate. As a career move, he described the switch to Telerate as “highly risky and probably foolish” but when the company sold shares to the public he became a wealthy man. (Reuters, it should be noted, followed suit a year later.) Eventually he became Telerate’s chief executive. Along the way John had become a US citizen, but in retirement he has returned to the country of his birth. “I missed the cricket and the awful weather,” he says. Nowadays, he is a supremely unfit, forward-thinking, 60 something, living in Esher, Surrey, with his American wife Martha. They have a daughter, Sara, a brilliant clinical psychologist. “Could come in handy one day,” notes her father. investing in start-up companies, while indulging his other passions for travel, reading, gardening and oriental art. In 2010, he was elected by Inside Market Data, the industry’s leading trade magazine, as one of the 25 most influential figures in the industry. “A knighthood was what I really wanted,” was his reaction.